Higher Education facilities are expected to be cutting edge learning facilities for extended durations. We work to ensure that sufficient capabilities are designed to support these needs. Strict budget requirements are a reality, and our designs provide significant savings through convergence of formerly disparate building systems over a common network transport. Converged systems can save considerable construction cost in K-12 campus design while providing the technology systems to support the education requirements of tomorrow. Bringing projects in on budget is always a concern, and even more so in K-12 Education. OneInterface prides itself on very accurate construction estimates and through very detailed construction documents. As a result change-orders are minimized and cost overruns eliminated. Accurate and complete documentation, long term maintainability, and flexible usage of space without construction projects are important design considerations for Health Care. Structured cabling plans allow a variety of medical and data systems to be deployed and reconfigured. Thoughtful design can allow many generations of fast changing medical technology to be deployed over the course of the 20-25 year structured cable system warranty. Working closely with municipalities to provide cutting edge services to internal agencies and the public, OneInterface has consistently pushed the technological bar into the future, while delivering projects in budget. Critical issues include underground pathways, serviceability, and documentation quality. Long lead times from project conception to construction present unique challenges. A variety of codes and standards must be adhered to, which often are updated prior to construction. We have found that strict adherence to the TIA/EIA as a minimum standard reduces the need to for costly redesigns in the future when projects are put to bid. Unique security requirements necessitate the infrastructure design that allows granular access to facilities for maintenance purposes. Budget constraints may limit deployment of all systems at construction. We work with owners to ensure that adequate infrastructure is built to accommodate the security and technology needs of the future. Hotels are increasingly providing advanced telecommunications services to their end users. Enterprise networking and telecommunications capabilities provide tangible differentiating benefits to end-users, and reduced costs to the owner. Rigorous documentation can provide the owner increased savings through remote administration of many properties from a single location. Providing developers an edge over the competition with cutting edge capabilities, and doing so in budget via convergence is our specialty. Flexible designs that maintain capabilities as floor plans are reconfigured and physical spaces are moved among suites is an important design premise. It is critical to provide these types of systems, while maintaining separation between suites to facilitate the ultimate data security that tenants require. Delivering capabilities desired by tenants, within the budgets necessitated by the fact that they are not investing in their own structure is the leading design premise in this market space. We provide Tenant Improvement designs that limit the permanent modifications to the structure, and provide the capabilities tenants would desire if they were constructing their own building. Working as part of a Design Build team, OneInteface.net can work closely with the builder to find innovative ways to bring projects in on budget with advanced features. Flexible manufacturer agnostic designs allow the builder to put pressure on distribution channels to provide the best pricing for materials. 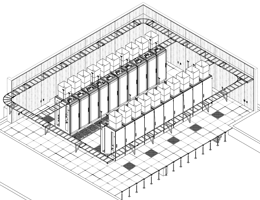 This new autonomous Data Center facility will replace the District’s current Data Center which resides in a building scheduled for demolition. The Data Center will vastly improve the delivery of technology services and capabilities in order to meet the District's current and projected needs. This multiple phased project will be completed in 2010 and is an $11,000,000 dollar project. This new Educational Center consists of a technology converged High School and Intermediate School. This project included a 200,000 sq-ft Academic Building, Performing Arts Center, and a swimming complex. The project included a complete network design for deployment into the construction schedule. This multiple phased project was completed in 2007. A joint effort with the City of Clovis and Clovis Unified School District consist of over 50,000 feet conduit infrastructure and nearly 300,000 feet of fiber optic cable. The project will connect 18 of the CUSD Elementary Schools within the City of Clovis to the CUSD District Office. The construction will be completed in 2010. This new facility provided the temporary 35,000 sq-ft housing for the Mountain House College Center’s future 85,000 sq-ft building. This project design included a technology advanced learning environment. The design established a new 12kV electrical service from MID and high speed data services from AT&T. The project was completed in 2009. This multi-story elementary school is located near downtown Stockton. This new facility was professionally designed, state approved, and contractor built as a Lease-Leaseback project. The project design enabled a technology enriched instruction capability and an IP surveillance system. The project was completed in 2007. 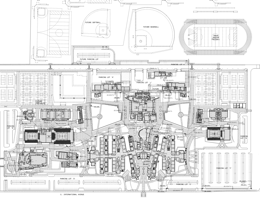 This new high school design includes the latest technologies required for today's challenging pre-college environments. The project also included the school district’s new Data Center, located on site, and a master plan for the modernization and migration of District services. The project was completed in 2009. This building was constructed in 1916 and is listed on the National Register of Historic Places. It was home to California State University and today is Fresno City College. This multi-phase renovation is extremely challenging to preserve its natural state and bring today's technologies. Phase-3 of the project will be completed this spring. The project consisted of over 80 IP surveillance cameras located within buildings and in parking lots throughout the campus. OneInterface also provided the network design and integration services to converge the District's new system onto their legacy network. The project was completed in 2008. The project consists of replacing the existing electrical service and cooling system. The Data Center is kept operational with zero disruption to keep District operations fully functional. OneInterface led the design team to replace the power, cooling, and server enclosures. The project will be completed in 2010. The modern design of this 100,000 sq-ft three story building includes technology enhanced classrooms with Digital Media A/V systems and a state-of-the-art lecture hall with an instructor to student discussion system. All network, telephony, and technology systems are integrated into the construction document set. The project will be completed in 2012. OneInterface led this major technology renovation design through the State Architect’s office and provided Construction Management services for CUSD. This project included multi-phased approach to keep services operational with minimum disruptions. All services were maintained throughout this process. The renovation was completed in 2007. This 2-story 50,000 sq-ft library renovation will consist of a technologically advanced information center that will create an atmosphere conducive to study and ease of modern information retrieval. Complete network, A/V, surveillance and public address systems are required for today's modern study environments. The renovation will be completed in 2010.